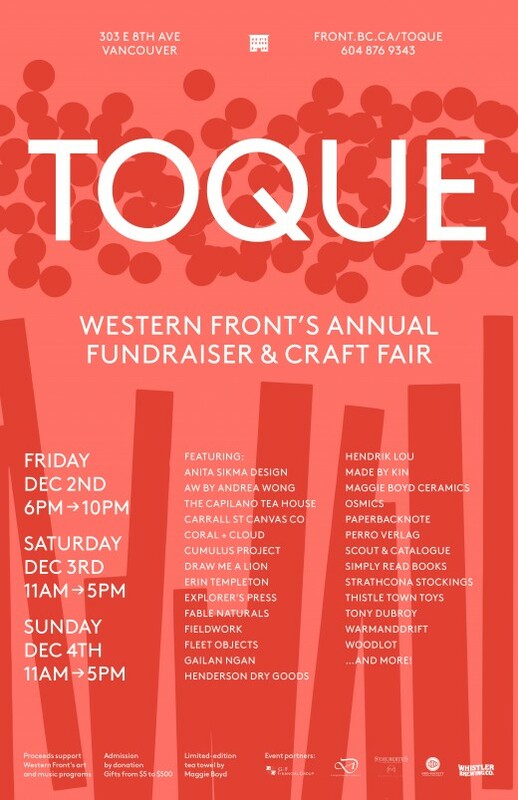 Toque is Western Front’s largest annual community event and fundraiser showcasing a curated selection of designers and artists. Shop for locally made products ranging from bags, bowls and books, to socks, scarves, wallets, ornaments, skin care products, candles, teas and so much more. Partial proceeds support Western Front’s year-round art and music programs. Our Holiday Membership Drive is on now! Join or renew before or at Toque and you’ll have a chance to win one of several prizes filled with gift certificates, passes, and, coffee, wine and more! Preview what’s on offer at Toque here. G&F Financial Group, Whistler Brewing Company, St Hubertus & Oak Bay Estate Winery, D-Original Sausage Company, Odd Society Spirits, A&B Partytime Rentals, Ethical Bean Coffee.